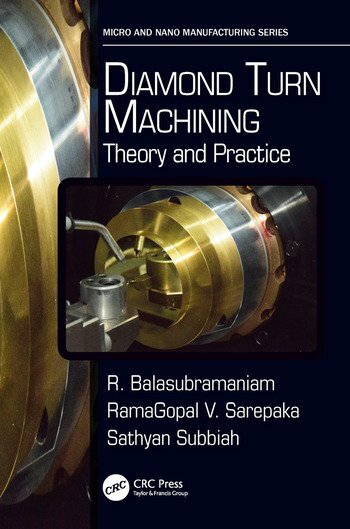 The goal of this book is to familiarize professionals, researchers, and students with the basics of the Diamond Turn Machining Technology and the various issues involved. The book provides a comprehensive knowledge about various aspects of the technology including the background, components of the machine, mechanism of material removal, application areas, relevant metrology, and advances taking place in this domain. Solved and unsolved examples are provided in each of the areas which will help the readers to practice and get familiarized with that particular area of the Diamond Turn Machining process. Dr. R Balasubramaniam has obtained his PhD from IIT Bombay (2000). He is working in the field of Ultra Precision Manufacturing (UPM) for multiple application areas for the last three decades at Bhabha Atomic Research Centre, Mumbai, India. Apart from R&D activities, he is active in teaching, guiding and mentoring doctoral and graduate students in various aspects of UPM and associated technology domains. Additionally, Dr.Balasubmaniam is involved in the promotion of UPM through academia and industry for societal applications including agriculture, assistive devices, health and education for rural areas. His other significant activity involves the growth of diamond turn machining community both in the country and globally. He has more than 100 publications to his credit apart from contribution chapters on Diamond Turning, Nano Finishing and Micro-Turning in text books on micro-machining. Dr. Sathyan Subbiah is working as an Associate Professor in the Department of Mechanical Engineering at the Indian Institute of Technology Madras. He obtained his PhD from Georgia Tech USA in 2006, MS from University of Illinois Urbana Champaign USA in 2000, and B.Tech from IIT Madras in 1997. He worked for three years in the automotive industry in Detroit where he had his first opportunity to use diamond turning for an automotive component. His more elaborate research ventures into diamond turning came during his time as an Assistant Professor at Nanyang Technological University Singapore. Here, he and his students attempted some unconventional ways to produce surface textures in diamond turning and also to improve flatness at edges. He is now actively exploring research opportunities in India in this area. He has guided 3 PhD students and several students in Masters Programs in the broad area of machining. Dr. RamaGopal V Sarepaka’s career graph includes academics at IIT Delhi; tenures at (CSIR-CSIO) CSIR-Central Scientific Instruments Organisation (as Chief Scientist) and (CSIR-AcSIR) Academy of Scientific Innovative Research (as Professor); As Visiting Scientist at Centre for Applied Optics, University of Alabama in Huntsville, Alabama, USA and at College of Optical Sciences, University of Arizona, Tucson, Arizona, USA. After his R&D and academic stints, Dr.Sarepaka is currently working with the Single Point Diamond Turning (SPDT) based Precision Optics Industry in India. His research interests include Precision Optical Instrumentation, SPDT and Surface Characterization, Optical Fabrication, Optical Design, Tolerance Analysis, with a sizeable volume of published work. He has guided several PhD students and graduate students in SPDT and Aspheric Optics. "…this promises to be a wonderful treatment of the subject for both practicing engineers as well as those pursuing specialization in DTM." "I am impressed by the contents of the book in general and the chapters like Diamond Turn Machines, and Application of DTM Products in particular. In general, academicians will discuss every aspect of the process but try to ignore machine building technology which involves design as well as manufacturing. Secondly, the process does not get right place on the shop floor unless specific applications of the process are explored. This book brings out both these features to the readers."